Not soapbox, not journal, not diary. Platform. In politics, a politician’s platform are the principles and ideas they market to the public to get votes. With video game consoles, the platform is the system that the games are built on. So what do these things have in common with getting more traffic to your blog? A good platform has a way of growing itself without a ton of extra effort. A politician puts out digestible soundbites so voters and pundits can easily discuss, debate and share, while game systems provide developers a computing framework to create fun, beautiful games. If the ideas aren’t solid and sharable or the framework is too difficult to use, the platform’s organic growth is hampered and may never reach critical mass. That’s partly why websites like BuzzFeed or Upworthy are shared by everyone you know. It’s not just because they provide great content, it’s also because the platform they’re built on make getting more traffic incredibly easy and intuitive. In this article, I’ll share 8 different techniques you can use to get more traffic and to make your blog grow itself. Hover over any of the images in a Buzzfeed article and notice that the image can be shared to many of the major social networks. If there are 37 images in this article, there are a minimum of 37 different opportunities for it to be shared over social media. Multiply that by four easy-to-share social options (Facebook, Pinterest, Twitter and Email), and now one article has 148 social sharing opportunities built in. Multiply that by every photo-list article Buzzfeed publishes, and it’s easy to understand why the site has 130 Million unique visitors a month. But, there’s a catch. 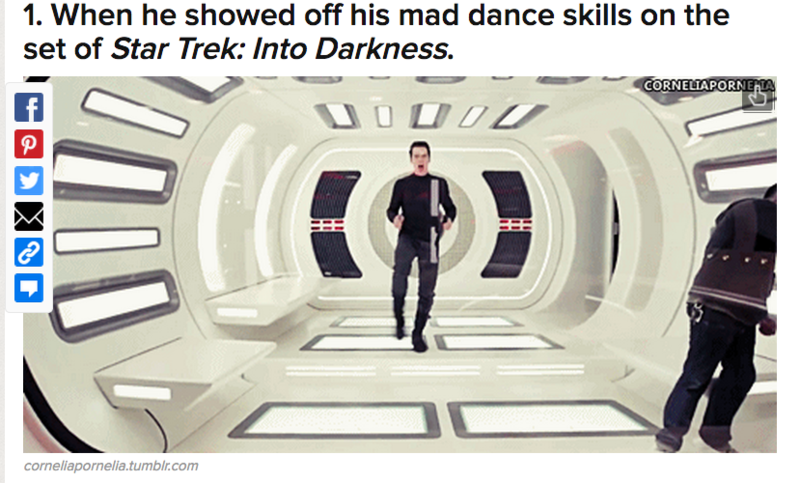 Buzzfeed knows its audience extremely well. The images it uses, like in “15 Signs Social Media Has Gone Too Far,” are images it knows the reader will find humorous and want to share. Of course, humor isn’t the only approach for sharable content, and what works best will vary from audience to audience. Understanding what your fans find visually appealing will help you to emulate aesthetics and help you stand out. Finally, if you’re wondering how you can execute the “portable photo” technique,Marker.ly has a wordpress plugin that allows visitors to share images directly from the post. If you’ve ever visited Upworthy, you’ve seen this when a video ends. 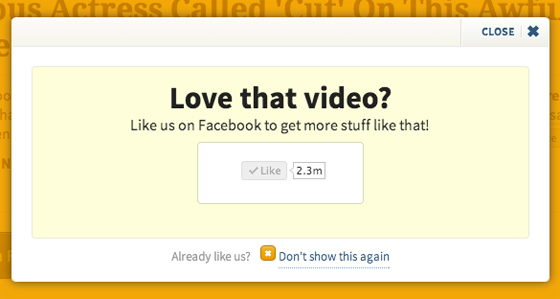 What’s interesting about the way Upworthy does this, though, is that they don’t just ask for email subscriptions. If you visit the site regularly, you’ll notice the lightbox also encourages you to become a fan on Facebook or to re-tweet the article. 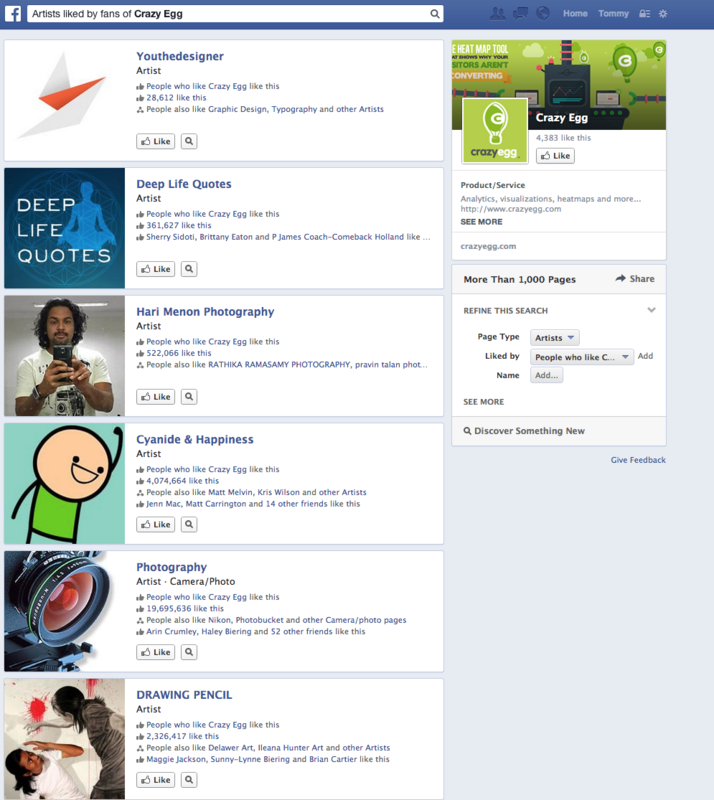 Not become overwhelmed with social sharing icons in a crowded sidebar. Have a single call to action—after they’ve consumed the content. “Follow” the brand one channel at a time. That last one in particular, I believe, is understated but has been instrumental to Upworthy’s growth. See, most of us litter our sidebars with social media icons, subtly asking our visitors to follow us on their social media platform of choice. Problem is, it’s well documented that too many choices leads to decision paralysis. By asking people to follow only one channel at time, Upworthy turns a multiple choice question into a simple yes or no. It should be noted that Upworthy makes a point to optimize content for every distribution platform—in other words, they write different headlines for email than they would Twitter or Facebook. That part is important, because if you’ve clicked the link through email, and you watch the video all the way through, they can ask you to connect on Facebook. This one-connection-at-a-time approach gradually builds the “being everywhere” effect, and increases the likelihood their content will reach you no matter where you are. <— This does not count. <— We’ve mostly become blind to this. <— You probably forgot about this until I pointed it out. Back in 2011, a study by BrightEdge found that social sharing icons resulted in a 7x lift in blog sharing. Problem is, just a year later, in 2012, 84% of search marketers agreed that social sharing icons were extremely important, and thus, it’s almost impossible to find a blog that doesn’t have social sharing buttons in the exact same places. But that’s actually bad, isn’t it? Display advertising suffers from banner blindness so doesn’t it stand to reason that button blindness could also be a thing? I mean, if we’re all putting our buttons in the same place, are they really unique enough to attract social sharing just by existing? Personally, I often forget to click those icons floating on the left, unless something strikes me as incredibly super remarkably mind-blowingly unique about the post. <— But they obviously work, so it wouldn’t be wise to get rid of them. What can you do instead? If we frame the content we want shared with social media calls to action, like the link above, we improve our chances of breaking that blindness. Upworthy understands this better than anyone right now. 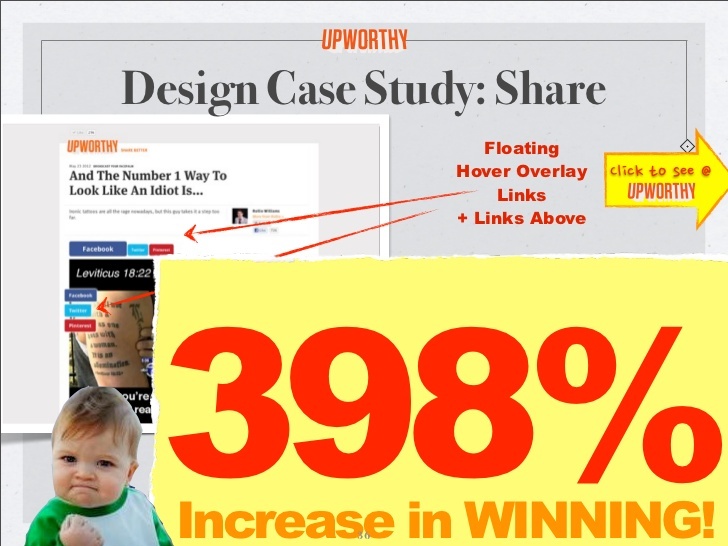 In case you can’t view the presentation, Upworthy moved social sharing from the top right sidebar to directly above the video content. They saw a 142% increase in social sharing. While that’s impressive, it pales in comparison to their next test, which resulted in a 398% increase after making social sharing icons float directly over the video. These “in content” buttons work because they break up viewing patterns and call attention to the action you want your viewer to take. By the way, this article by Social Media Explorer will show you how to add custom social buttons you can link to in content. At the end of nearly every BuzzFeed article, there’s the “Next On” area which is essentially a recommended post widget. But did you know BuzzFeed consistently tests the featured images and headlines in this area to draw people deeper into the site? Imagine getting regular traffic to old articles because people are genuinely interested and you’ve intentionally funneled them there. This works so well for Buzzfeed because the Next On post is extremely relevant to the page you’re already on. If you wanted to implement inexpensively, the Yet Another Related Post, Related Posts by Zemanta or Outbrain plugins are all great options. Be warned though, using plugins means you must have strong categorization and tagging skills so the plugin can display the next “logical” choice. This approach also means periodically going into your archives and switching the headlines and featured images to determine what headline/image combinations drive the most clicks. If you want to get real serious about creating a flow to your website though, I’d recommend using Optimizely to manually insert links to other articles and A/B test the headlines and images that drive the most clicks. While that may seem like overkill, reducing your bounce rate and improving the time spent metrics are critical for business goals like customer development, conversions and search engine ranking. Is it just me, or do articles that use embedded media just feel more valuable? If you’re a content creator, those embeds are more valuable than you realize. If someone presses play on your slideshare embed on the blog, it counts as a view on the Slideshare website. Generally speaking, if a piece of embedded content gets a lot of views, the higher it ranks on the platform it was embedded on. The higher it ranks there, the more people you can funnel back to your blog, creating a nice little growth loop. Many of the major sites that allow embeds, like Slideshare or Youtube, also tend to rank well in Google. So with one simple embed, you could you triple the likelihood of driving more traffic to your blog. Now, what if you embedded a SlideShare presentation AND a fully optimized Youtube video? Do you think it would make the experience richer for your readers? Do you think longer time on site tells Google that you’ve created a high quality page? You bet it does. Even if you just start by re-purposing your old content into new media formats, you can see an improvement in traffic to your blog, especially if you combine it with this next tip. I’ll be honest, I’ve been really impressed with Matthew Woodward, lately. A couple days after subscribing to his email list, he sent me an email about why a certain popular SEO tool must not be trusted. This got my attention, specifically because it wasn’t the typical “How to do some simple internet marketing thing.” It was real advice that could actually influence a real decision I’d make for my business. Then, two days later, he asked if I could help him get the article voted up on inbound.org. Ok, that’s interesting. A few days after that, he asked how he could help me! This kind of back and fourth value exchange can easily be automated for you to breathe new life into older content and help you create new content that is sure to connect with your readers. 1.) Write an email that links to an evergreen article within the archives of your site. 2.) Create a segment, or tag for the subscribers who click the link. Schedule the email to send as the first in an autoresponder sequence. 3.) Write a second email that’s only for subscribers that clicked, asking them to take some kind of action—upvote, tweet, “like”, +1, etc.—and link to that social page. 4.) Create another segment for the people who help distribute your content. 5.) Ask those people how you can help them, or give them something extra for helping you. It’s important to note that, even though the autoresponder itself is driving more traffic to your blog, it’s the segmentation that tells you early on who you can rely on for distributing your content and taking action. Focus on these people. Email them first when you create new content. Ask them their pain points, and figure out what they need. They will likely become your best customers later on. You’ve probably heard about the “Thank You” Page being valuable real estate for upselling or getting more fans to social media channels. But have you considered using the “Thank You” page to increase word-of-mouth buzz just by offering another free resource? Refer-a-friend programs have proven to be incredibly valuable for companies like Dropbox, who attributes 35% of their daily signups coming to their referral program, or Roku, who report around 55% of their customers hearing about the service from a friend. In fact, with the right incentive, referral programs can be powerful and extremely cost effective. According to Neilsen, 92% of consumers trust peer recommendations, and a study by the University of Chicago found that non-cash incentives are 24% more effective at boosting performance than cash incentives. As a nice bonus, the Wharton School of business also found that referred customers have a 16% higher lifetime value. Now, the trouble is, programming a refer-a-friend program on your own can be tricky and time consuming. Services like InviteBox.com or Friendbuy.com offer starter solutions for $19 and $25 respectively. These two companies power the referral programs for companies Mailchimp, Shopify, LegalZoom and Dollar Shave Club, so you’ll be in good company. If you don’t mind spending money to retain your readers, run retargeting ads to your blog’s email subscribers. The idea here is not actually to sell anything, though. At least not all the time. Instead, you’re using retargeting to get impressions on your reader and stay top of mind. But wait? What about banner blindness?! Isn’t that still a thing? 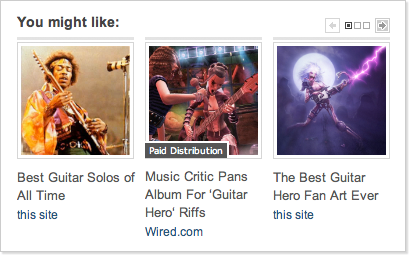 Not really with retargeting ads. This plays on a phenomenon known as The Mere Exposure Effect, a psychological phenomenon by which people develop a preference for things simply because they’re familiar with them. This principle is why TV advertisers run the same ad multiple times during a show, and why publishing frequently helps you grow faster. The difference with email retargeting is, you not posting 6 times a day or spending ridiculous money for impressions. You’re simply ensuring you reach the people who’ve already expressed an interest. Something that’s increasingly difficult to do today with the high level of noise out there. I’ve written about email retargeting pretty extensively, so if you want to dig in on the mechanics of it, I recommend you check that article out. Finally, we made it! This last one is pretty low tech. Sometimes all it takes is a straightforward question. If you thought this article was valuable, would you mind giving it a share? Also, if you get an extra second, I’d love if if you left a comment letting me know which technique you found the most interesting.